Some cats love being brushed and don’t mind having their nails trimmed. Jericho is not one of ‘those’ cats. He tolerates brushing for about ten strokes unless you are trying to brush his belly… that you do so at your own peril. Don’t get me wrong, at 18-years-old, Jeri-kitty is a pretty easy going guy, but he had his pelvis broken when he was 4 and he’s not a fan of having his underside touched. To his credit he’ll give you a fair warning: a howl, a hiss or a ‘warning nip.’ All fair communiqué from a non-English speaking mammal. 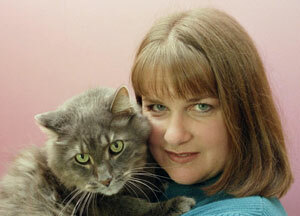 I adopted Jericho from the Minnesota Valley Humane society on April 17, 2002. He was about 9 years old at the time and the name on the surrender form called him Pepper. I’d never had a cat before. In fact, I didn’t really like cats. I always fancied myself a dog person and what’s more, I lived with dogs, birds and fish. How would a cat fit into this animal family?